Yesterday I found an e-mail in my inbox that gave me a bit of a spooky feeling in my stomach. Ordinarily such a mail would have quickly ended up in my trash if it weren’t for the details they put in there. Why would Microsoft be contacting me? They obviously did a bit of digging or reading to know that I created the apps for CCS Publishing. They didn’t bother to check on my references page though. The ACLS app was done by somebody else. But still it shows a fair amount of data mining as they appear to have checked those apps’ rankings and then cross referenced them with who was the real author. Here’s a facsimile of the e-mail to preserve the look and protect the mentioned e-mail addresses from spambots. Analysis of the e-mail headers shows that the e-mail comes from Redmond via Microsoft’s partner extranet. The companies CompuCom and Excell Data Corporation are Microsoft partners doing their bidding using Microsoft’s mail system. The author of the e-mail bears the title “US ISV Evangelist” identifying him as somebody whose task is to preach the Microsoft gospel to Independent Software Vendors located in the USA. CCS Publishing is, I am not. Microsoft is looking at investing time and resources in assisting your company to extend beyond your existing platforms and unto our new Windows Phone 7 platform coming in late fall 2010. This is a great opportunity to generate additional revenue and/or exposure from a net new channel. The “investing” buzz word is code for “we will make you rich if you help us rule the mobile world”. 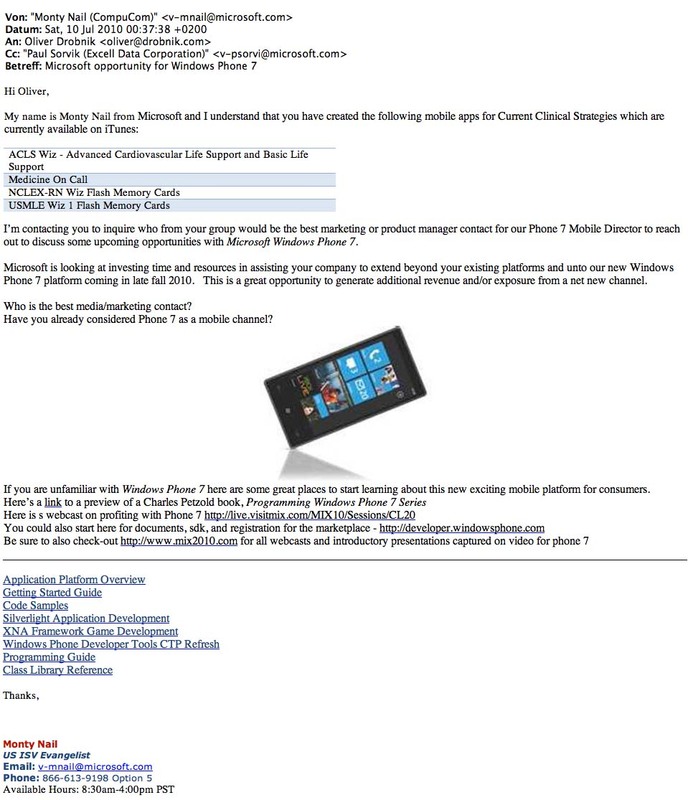 Apparently Microsoft is looking for iOS Developers to be pushing for an interesting lineup of Windows Phone 7 apps when they are launching it. Understandable. It’s the number of apps that make the success of a platform. You could probably guess my response. I previously elaborated that my own strategy concentrates solely on the iOS platform. I am already seeing this approach bear wealthy fruits because my multiple iPhone/iPad-related activities are in a state of constant cross-pollenization. I’ve adopted Apple’s strategy to sharply focus your resources and not get distracted by “other things you could also do”. In short I love the business that Apple enables me to conduct, I am very satisfied by it. Sorry Microsoft, my loyalty to iOS is not for sale.